Not working if using the 'go to deal' link. When it does work I wonder if it'll still work if you use the ribs for 2.99 instead of 4.79, too? It DOES work. I did the free strippers link first but it didn't seem to work until I pressed checkout and added a pizza. Then I used the ribs link and the strippers and ribs are there. It wont work with me ??? Works for me at the Thornton-Cleveley's store. 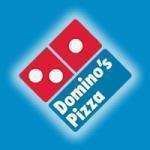 It should be noted that when I follow the link it signs me into my dominos account automatically. I recommend you sign in using a different tab first, then click the link in this thread. Not working if using the 'go to deal' link. When it does work I wonder … Not working if using the 'go to deal' link. 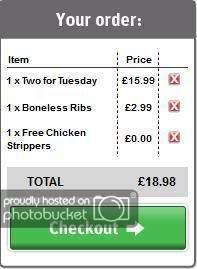 When it does work I wonder if it'll still work if you use the ribs for 2.99 instead of 4.79, too?http://www.dominos.co.uk/?sku=1540It DOES work. I did the free strippers link first but it didn't seem to work until I pressed checkout and added a pizza. Then I used the ribs link and the strippers and ribs are there. Did anybody else get the boneless ribs? They're actually belly pork and very fatty which I think will put a lot of people off. The Duckchess wouldn't touch them and ate all the strippers, because "that's fair". Ha! I've had the ribs before and didn't like them, so I didn't bother. Good deal if you like all that fat though. Thanks again OP.Did anybody else get the boneless ribs? They're actually … Thanks again OP.Did anybody else get the boneless ribs? They're actually belly pork and very fatty which I think will put a lot of people off. The Duckchess wouldn't touch them and ate all the strippers, because "that's fair". Ya, the 'ribs' are just fatty pork belly. I think they taste awesome though. Ha! I've had the ribs before and didn't like them, so I didn't bother. … Ha! I've had the ribs before and didn't like them, so I didn't bother. Good deal if you like all that fat though. This didn't show up for me until I went to check out. Fab deal, thanks! I lurve them strippers! Worked for me just had to refresh the page a few times! Thank you! Me and my friend have just used this! 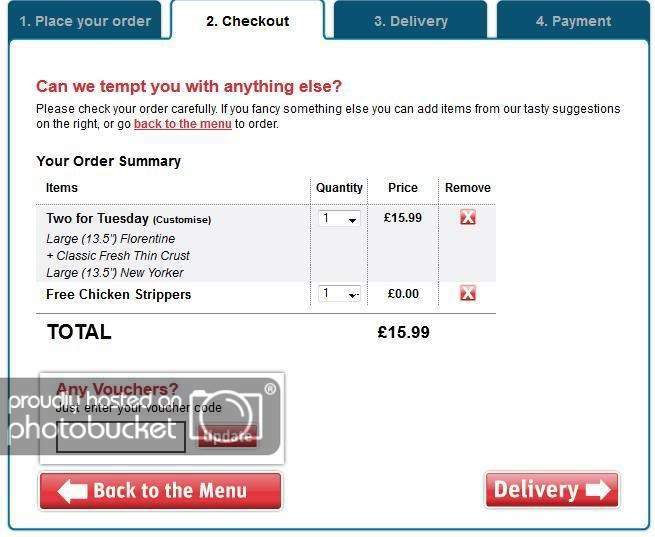 Code worked in conjunction with £9.99 pizza offer. Thanks.